We had a great time! Loved the area to relax upstairs without having to lay in bed and watch tv like you have to at a hotel. We thoroughly enjoyed the escape! We went on the train ride, visited Mountain Layers brewery and chocolate shoppe. All of my interactions with the staff were wonderful. I received a call from Kathy to check in with us to make sure we had arrived safely and that we had everything we needed. They were professional and courteous. Everything was wonderful. The cabin was beautiful. The view was magnificent. The only activity we did other than simply enjoying the peace and solitude of the cabin was watching a bear who came to visit. The bear wandered around the driveway on two seperate mornings as it foraged for food. It was a beautiful site. The entire cabin was well suited, furnished, and great view. We had an amazing time on our honeymoon. We will be back! It was darling! For a small property, there were several different places to relax and enjoy. Downstairs, upstairs, inside, outside, side deck, fire pit...it was almost hard to decide where to hang out! We had everything we needed to cook and stay. The toiletries were a nice unexpected touch, as was the reading material. It was also very nice to have a gas grill with propane ready. We didnt use the outdoor fridge, but certainly would have if we could stay as long as we wish we did. We wanted for nothing, all of the information we needed was well provided. 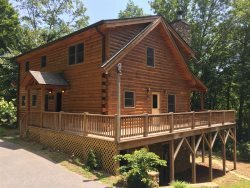 We liked the privacy, the mountain ridgetop views, and reasonable price. Hiking, shopping...it was a quick trip, the best activity was enjoying the view from the deck and hot tub. I had forgotten how bright the stars are out there. How truly well appointed it was. There are plenty of places I could have stayed and had a beautiful view, but be eating off of paper plates or not know what there was to do in the area. Not even close to the case with this property. The cabin was very nice, clean and well taken care of. The views were incredible and we were very impressed. We Loved that they gave us a list of things to do ahead of time, as well as written directions, easy to follow. The hot tub and the outside kitchen were wonderful. Bear Bottoms was an absolute pleasure. Quiet and peaceful. We celebrated our 26th wedding anniversary Everyone I dealt with was very helpful and friendly. The emails before our trip about what to see and do in the area were very valuable. We loved how secluded it was and the great view from the deck. The check in and check out were easy; we will be back again! Also, we left something behind when we departed; it was found and they sent it to us! That's great customer service! Loved the clean white sheets & towels! We have stayed in Bryson on a couple occasions (different rental Co.) and the sheets & towels were stained and worn out. Everything was great! The cabin was very private, quiet, nice view. Just what we needed to get away from it all! We celebrated our 26th wedding anniversary. It was just what we were looking for and we weren't disappointed. Bear Bottoms Chalet was amazing. The seclusion of the cabin mixed with the view from the hot tub made the experience everything we wanted. The trip up/down the mountain really wasn't that bad considering how high up the chalet is. The website was easy to use and the prices were cheaper than AirBnb for the same cabin. We celebrated our 12th anniversary. We thoroughly enjoyed your Chalet. Clean, cozy and beautiful! The Hot Tub with a view was one of the most attractive features when we were choosing a cabin and it did not disappoint. Thank you for contributing to our perfect vacation. It was exactly what we needed. Thank you for letting us stay in your wonderful cabin. We had the best time here and will definitely be back! Thank you for an amazing time! This was a wonderful surprise for my friends. We will be back! We loved feeling secluded and away from the hustle and bustle. We enjoyed the hot tub. The staff was very easy to work with.